An Eagan elementary school is promoting a program distributed by the Southern Poverty Law Center, an organization that files lawsuits against schools to restrict disciplinary practices and promote gay rights. Glacier Hills Elementary School, a District 196 magnet school, has placed posters at its entrances promoting the organization and messaging some view as anti-male and confusing to students. The law center has filed litigation and supporting briefs in courts across the country seeking to intervene in student disciplinary issues and advocating gay and transgender rights in schools. The group publishes a website purporting to advise students of their legal rights and urging them to contact the organization. The organization has pushed its agenda through a program called “Teaching Tolerance” and publishes a magazine called Tolerance. The latest issue of the magazine refers to masculinity as “toxic” and, in a separate article, warns teachers that the “alt-right” could be recruiting their students. Posters at the entrance of Glacier Hills Elementary School promote "Teaching Tolerance" a program of left-wing political group the Southern Poverty Law Center. The organization has been recruiting students for lawsuits against schools. The Minnesota Supreme Court affirmed the sentence of an identity thief captured by the Eagan Police Department who was ordered to pay $66,000 restitution -- $1,000 to each of 66 victims. Emile Rey, 38, of 9041 Euclid Ave. S, Chicago, was sentenced to 58 months in prison and ordered to pay $66,000 restitution in November 2015 following an agreement to plead guilty to identity theft, according to court records. His co-defendant, Sade Robinson, 24, of 3908 Valley View Dr. #306, Eagan, was sentenced only to probation and $5,000 restitution, according to court records. Robinson was not part of the appeal, which was decided by the state supreme court Jan. 3. The state has been deducting restitution from Rey’s prison wages, according to court records. So far, less than $1,000 restitution has been paid. Rey pleaded guilty to a single count of identity theft involving eight or more direct victims. The charge stemmed from a 2015 Eagan police investigation into the use of a cloned credit card at Target. The investigation revealed many credit cards had been cloned and used to buy gift cards, some of which were redeemed in Chicago. Rey was arrested after he tried to use cloned credit cards at the Eagan Target store, according to court records. Minnesota’s identity theft statute requires a mandatory minimum restitution of $1,000 to each victim. Rey argued that provision of the law was unconstitutional. The state supreme court disagreed, reasoning Rey had notice he could be required to pay $1,000 to each of the 66 victims, even though none of the victims had completed paperwork to request restitution before his sentencing. U.S. District Court Judge Ann Montgomery Jan. 4 sentenced an Eagan man who received the state’s largest seized shipment of methamphetamine in 2017, nearly 100 pounds, at his Beatrice Street home to 10 years in prison, the mandatory minimum under federal law. The federal judge rejected a request by federal prosecutors to make an example of three co-defendants charged in a methamphetamine distribution conspiracy because of the size of the shipment to the Eagan house. Prosecutors requested a 17-21 year prison term. 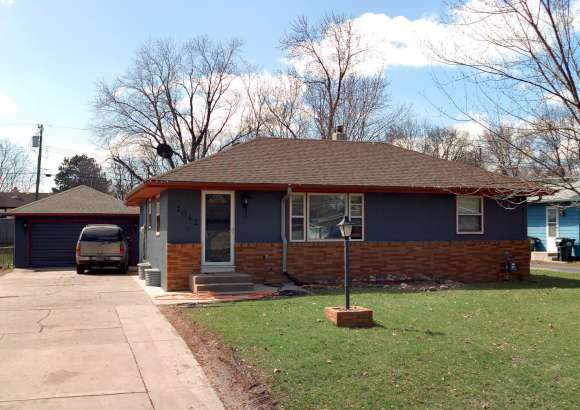 In their sentencing requests, the prosecution and defense painted different portraits of the 1042 Beatrice St. house where Jesus German, the last of three co-conspirators to plead guilty in a conspiracy to distribute more than 100 pounds of methamphetamine shipped to Eagan from California, greeted a load car full of a substance replacing the drugs that had been intercepted by police in South Dakota last February. Federal prosecutors called the rented house near a city park a stash house, while the defense has portrayed it as the family home of a hard-working father of four who accepted a non-violent criminal opportunity under the financial pressure of raising a family. The conspiracy conviction carries a 10-year mandatory minimum prison term. However, the prosecution and defense agreed to waive that minimum as allowed by an exception under federal law for non-violent controlled substance crimes committed by defendants without criminal histories. The defense requested German, also known as Arturo Juarez-Madrigal, be sentenced to 60 to 80 months in prison, or 5 to less than 7 years, far below the 135-168 month range under the defense interpretation of federal sentencing guidelines. In its sentencing request, the defense claims German’s involvement in the conspiracy was a lapse in his character brought on by financial stress and that his four children need him. “[T]he Court may consider the fact that there are four children [who] need Mr. German in their lives,” defense lawyer Gary Wolf wrote in a sentencing memo to the court. The U.S. Attorney’s office recommended a sentence three to four times higher than the defense: 210-262 months, or 17 ½ to 21 years, in prison. In its recommendation, the prosecution noted evidence in the home consistent with the operation of a meth lab and argues the home was used as a “stash house,” used to hold deliveries of controlled substances. The house alleged to be a methamphetamine stash house is located about a block away from an Eagan city park, Lexington Park, which features a large children’s playground and skating rink. In arguing for the higher sentence, the prosecution also urged the court to send a message. The state has sought forfeiture of the $118,500 cash, but not the house itself, according to court records. The $208,000 house is owned by third-parties, according to Dakota County property records. The driver of the car intercepted by S. Dakota police en route to Eagan, Abraham Suazo, pleaded guilty to his role in the conspiracy and was sentenced last September to 10 years in prison, to be followed by five years of supervised release, last. The federal court sealed a document related to the reasons for Suazo’s sentence. The court requested he be placed in prison in California so he could be close to his family, according to court documents. The third defendant in the conspiracy, Hector Arnulfo German Reyes, a.k.a. Luis Manuel Sanchez-Lopez, was scheduled to be sentenced after German on Jan. 4, but the court has twice cancelled his sentencing without explanation. Reyes’ lawyer has portrayed him as a bit player in the conspiracy, an illegal immigrant from Mexico with a seventh-grade education who fled a family history of poverty and domestic abuse and accepted a job cleaning methamphetamine to earn $500. The defense claims Reyes was only in Minnesota for 15 days before his arrest, according to his defense lawyer, and was never paid. Reyes’ lawyer has proposed a sentence of 3-5 years. Federal prosecutors argue the 1042 Beatrice St. house slated to receive 100 pounds of methamphetamine last February was a drug stash house, warranting a longer prison sentence for an Eagan man who pleaded guilty a federal drug conspiracy charge. Eagan Mayor Mike Maguire noticed a “striking similarity” between a company logo that has been posted on a sign at a city construction site for months and the city’s new $75,000 logo awarded as a result of a no-bid contract. The Mayor mentioned the similarity at the first city council meeting of the year Jan. 2. The similar logo was included on paperwork during a council review of an Advisory Planning Commission decision at the United Properties site. “Am I the only one who noticed a striking similarity between the United Properties logo and the City of Eagan logo?” Mayor Maguire asked as the council considered a motion to subdivide a 43.2 acre property into two lots. Councilmember Cyndee Fields agreed. The City of Eagan's new logo, left, and the logo from a United Properties sign at the Prime Therapeutics construction site near Lone Oak Road. Faced with a sub-zero temperature forecast, Dakota County Parks cancelled its popular New Year’s Eve celebration at Lebanon Hills Regional Park. The family friendly party, held for the past 11 years, has drawn large crowds in recent years. The event is an alcohol-free alternative to the typical New Year’s Party. Running from 5 to 8 p.m., it features sledding, ice skating, a candlelit hike around the lake, indoor activities, and an 8 p.m. ball drop and singing of Auld Lang Syne. “Forecasts are calling for minus 20 degree wind chills during the event, which makes it unsafe for the public, staff and volunteer[s],” the department wrote on its website. The Eighth Circuit federal appeals court upheld the sentence of an Eagan man convicted of conspiracy to distribute cocaine. Sharrod Rowe, of Eagan, was sentenced to five years in federal prison in October 2016, following his conviction on a federal drug conspiracy charge. Rowe was arrested following a motor vehicle stop near Minneapolis during which police found about six pounds of cocaine in the BMW he was driving, according to court records. A confidential informant had tipped police off that another person, who owned the BMW, would be driving a shipment of cocaine from Arizona to Minneapolis on the date Rowe was stopped in the BMW. Rowe challenged the court’s calculation of his sentence under federal guidelines, arguing he was entitled to a lesser sentence because he was merely a courier, not one of the main players in the cocaine operation. He also challenged the trial court’s ruling to admit evidence in the case he claimed was obtained in violation of his constitutional rights.